The crash on eastbound Hwy. 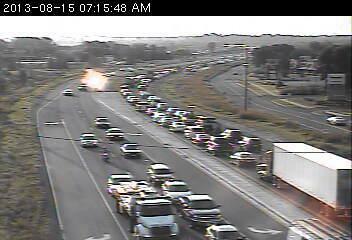 13 at the 35W interchange has traffic jammed back ot Lynn Avenue in Savage. This one will be there for a while as a vehicle rear-ended a dump truck. Once on northbound 35W, things are tight from County Road 42 up to 98th Street. Stacked up on Hwy. 13. Crash 1 mile up the road.